So we’ve got the apples. I have no idea what variety they are but in their uncooked state they’re very tart but once cooked they stay firm but yield a soft sweet texture similar to a bramley. We’ve also got blackberries. We always called them brambles and I remember that mum had a thorny bush in her back garden growing over an old air-raid shelter that’s now sadly been pulled down. I think she’s lost the bramble bush but I haven’t lost my memories of her incredible apple and bramble pie. 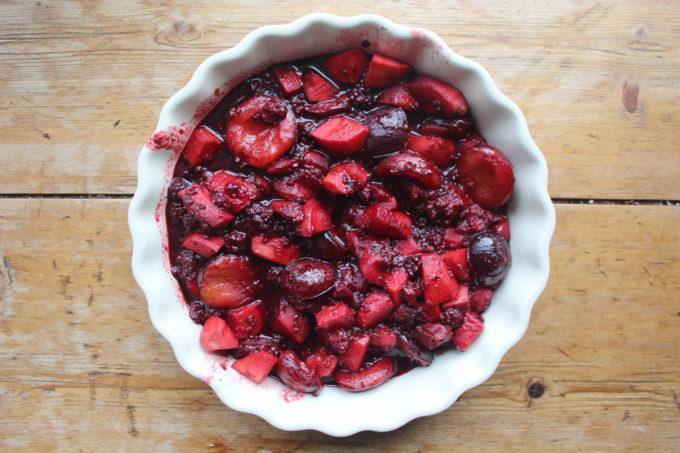 Such an incredible combination of fruits… tart and sweet and devilishly blood red… and of course we have plums. They are Victoria Plums, the dark purple variety and my favourite. They’re the type of plum that tastes of plum, if you get what I mean. I’ve kept it all very simple with just a dash of cinnamon and vanilla bean paste but the crumble is really rather special with porridge oats, ground almonds and some little ameretti biscuits crumble in, that I found at the back of the cupboard. I have been craving crumble ever since I saw this on your IG Stories, my waistline is very cross with you, but my goodness this looks heavenly. oooh, Im so sorry! It was exceptionally good! 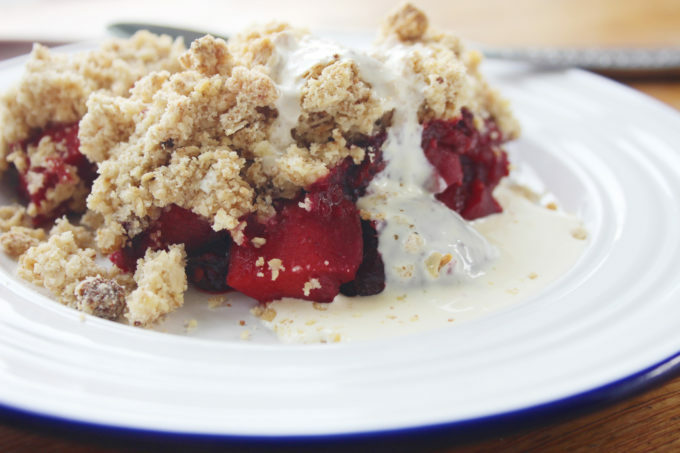 What a delightful crumble! Foraging for berries and fruit is always great fun. Blackberries freeze well too, if you have any spare. 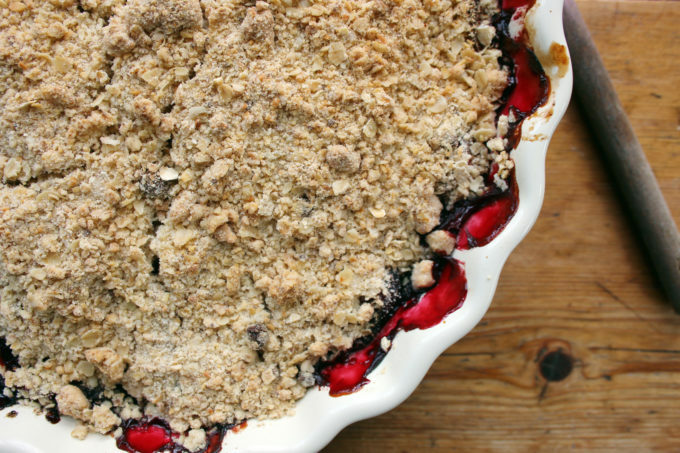 Love the addition of amaretti to the crumble top, what a fab idea. Thanks G… they do freeze well, I always forget that! Delicious. I love a bit of foraging. I remember as a child we would go somewhere in Wanstead blackberry picking. And then in my teenage years we would go up Hainault Forest or out the back of Abridge somewhere and pick blackberries. 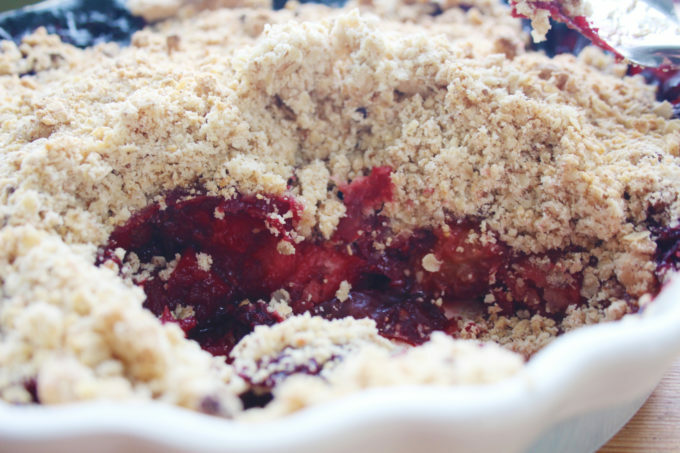 They make such lovely pies or summer puddings, but crumble is my all time fav. 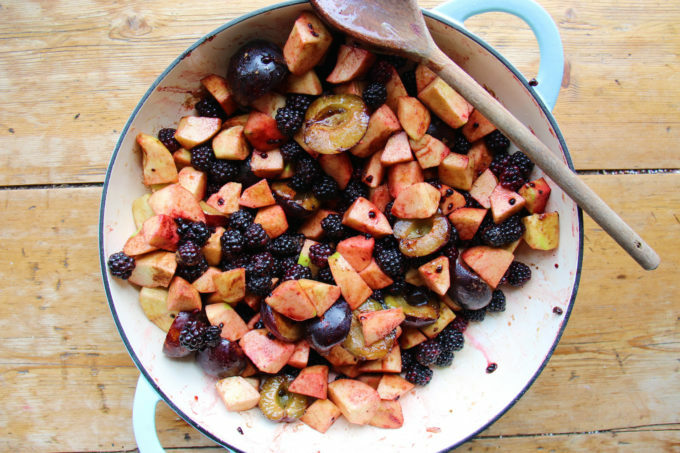 Mixed fruit crumbles are my absolute favourite and taste even better if the fruit is foraged. 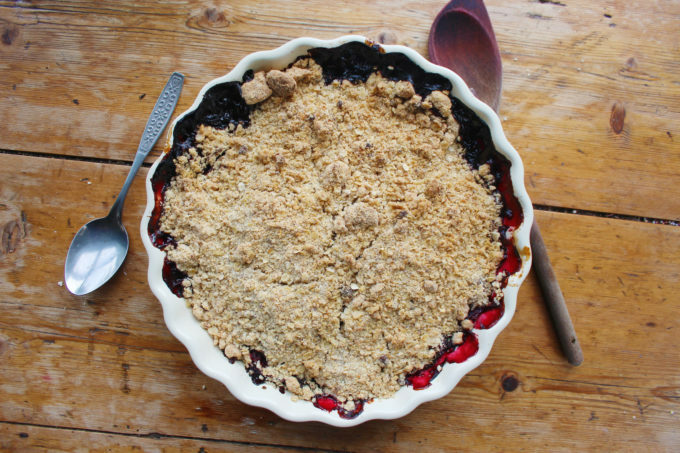 I never thought of putting amaretti biscuits in the crumble topping, brilliant idea. And you’re right about Victoria plums. They are the only plum that really tastes of plums, most of the supermarket ones tasting of very little at all. I really miss the Victoria plum tree that we had at our previous house. Sometimes life just gets in the way of all the things we want to be doing! I do love this time of year with free food in the hedgerows though. Although the blackberries and apples do seem a little early this year…. Oh Dom, I do feel for you not being able to enjoy your kitchen and the poor Viking missing his garden. But as you say, busy isn’t always bad. I’ve been terribly remiss at not visiting your blog in my usual fashion. things here are even more hectic than usual. We’ve made the rather difficult decision to move up to Hampshire, so there’s much to organise. 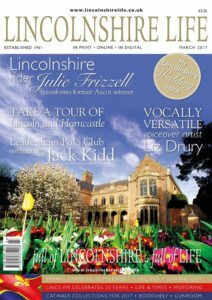 It means I will at last have a decent garden – hooray! Cooking with foraged food is so satisfying and your crumble sounds divine. 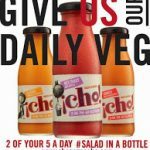 I want some – quite badly! Hey C… lovely to hear from you! The move sounds exciting. Crazy busy times eh?